The Lower East Side Tenement Museum at 97 Orchard Street has been on my bucket list for a long time. For years as a Third Grade Hebrew school teacher, I facilitated an immigration project with my students. The students would first spend time learning about Jewish immigration through fiction and nonfiction books, maps, videos, websites and a visit with Mrs. Shapiro at the Shapiro House at the Strawbery Banke Museum in Portsmouth, N.H. The second part of their project involved interviewing a family member, who was an immigrant or who knew an immigrant ancestor. 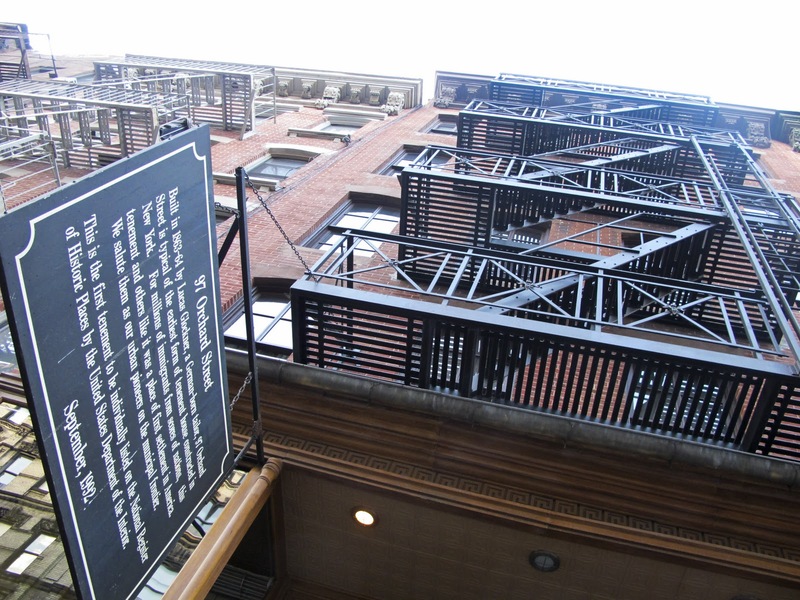 It was an ambitious project and so we only spent a brief period of time learning about the Tenement Museum in New York City, but every year my interest in visiting this place was renewed. 97 Orchard Street is just a couple of blocks from Sammy's Roumanian Style Restaurant. We were due there at 6:00 PM for dinner with our 'long lost' cousin and so we made a reservation for the 4:45 PM Piecing it Together tour. One thing you should know about this museum is that the only way to see it is by guided tour. 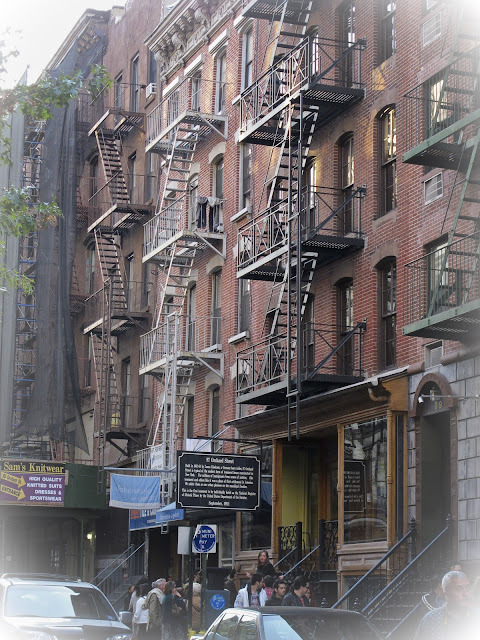 I would have loved to have spent the whole day going on all of the tours and seeing the entire tenement, but I knew that my husband, M.J., and the kids would stage a revolt. The best I could hope for them to do (if a little grudgingly) was a one hour tour. Conveniently I was able to make the reservation online and luckily as well because all tours were sold out by the time we arrived. I chose the Piecing it Together tour for two reasons; the first because it would show how two Jewish families lived in the tenement and the second because one of the families was involved in the garment industry. M.J.'s Jewish immigrant ancestors were not involved in the garment industry, but my Irish Catholic immigrant ancestors were and lived not far from the museum at 401 East 10th Street. 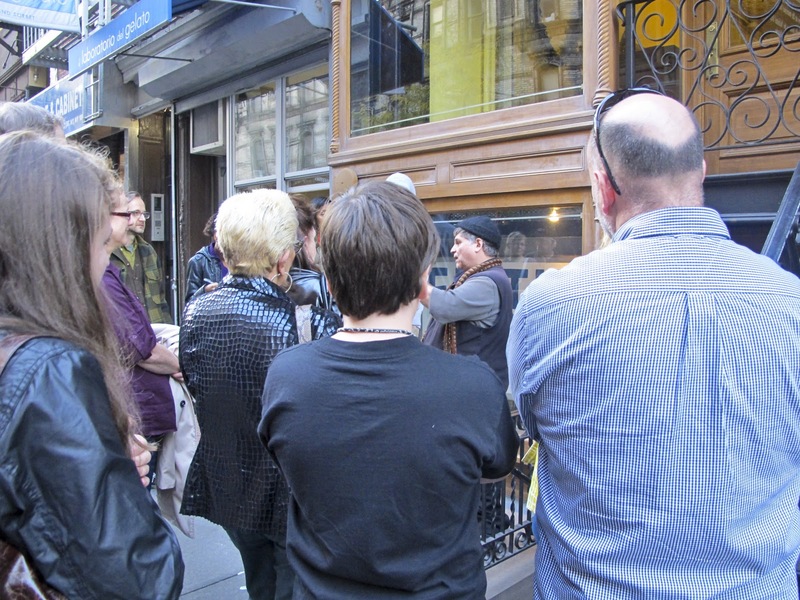 All tours for the museum begin not at 97 Orchard Street, but at 108 Orchard Street, where their gift shop is located. This is at the corner of Orchard and the infamous Delancey Street. Just down the street you can see the tenement building. Our tour guide was Dave, a veteran guide of seven years at the museum and a descendant of Lithuanian and Italian immigrants. Dave knew his stuff and brought the Rogarshevsky and Levine families to life. More importantly he piqued and held the interest of my highly disinterested 11 and 14 year old kids. Before we entered the museum we found out we would not be able to take any photos, but that www.tenement.org had an entire section of photos available for free download. This made sense once we were inside and found that most of the interior is original. Very little restoration has been done. It feels very much like a tenement. It is dark, and the original layers of flooring and wall papers are there. Dave told us that there will be a museum project or exhibit that will show the process they are going to use to do some restoration, almost like an archeological dig, but on a building. It sounds fascinating. Our hour on the third floor of the museum in the Rogarshevsky and Levine apartments passed very quickly. One last thing of interest to those who do genealogical research is that the museum has traced forward the ancestry of those known to have lived in the building. They have been able to gather pictures and oral interviews of former residents adding immeasurably to the experience for tour guests. It's a visit I will long remember.